THE FLAME AND THE ARROW takes us to 12th century Italy, in the region of Lombardy. Since its Warner Brothers taking us there, in 1950, with Technicolor, things look pretty clean for medieval Europe, and those costumes glow. Its a trim 88 minute swashbuckler, in the style of the same studio’s The Adventures of Robin Hood, with some sets and outdoors locations looking familiar. Directed by Jacques Tourneur,the silly, harmless fun raked in a healthy profit and two Oscar nominations (cinematography and music score). 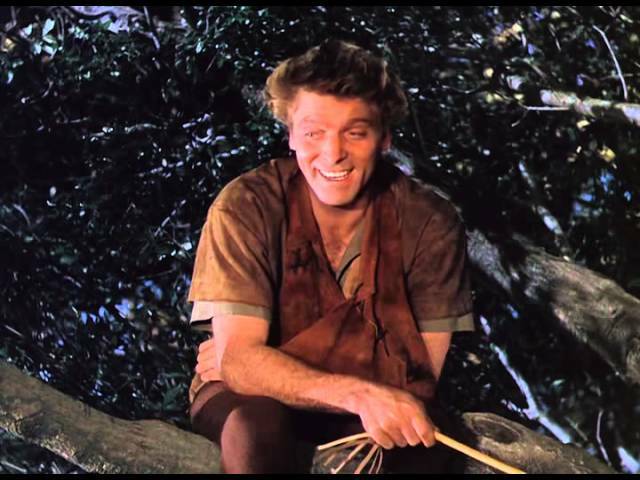 Main reason to watch is Burt Lancaster, bounding into his zesty action period (Ten Tall Men, The Crimson Pirate, Jim Thorpe-All American, His Majesty O’Keefe, Vera Cruz ) with easy grace, that great grin, and the happy assistance of his partner from acrobat days, Nick Cravat. Burt is ‘Dardo’, charismatic leader of rebels against ‘The Hawk’ (hiss, boo), played with smarm by Frank Allenby. Leading damsel is Virginia Mayo, who at one point is shackled to a tree, all the more convenient for Burt to woo her and for her to wow us with her gams. Other players include Robert Douglas (destined for a swordfight in the dark with Dardo) and Aline MacMahon. Max Steiner’s score is bouncy, Burt impresses with his athleticism and there’s a mop-up where the roused peasants use every kind of tool the prop department can round up to gleefully wipe out the castle garrison. Its the type of swashbattle where dozens of stuntmen are bonking each other all over the place, one guy is dressed in a bear costume, a supporting maiden gets a lusty kiss planted on her during the melee and an excited terrier barks at everyone from atop a pillar. If he didn’t chain me to that tree,how would I know he cared? Good thing I packed my high-born ladies pond wear….